In the wake of his sister's suicide Shane has life force him to the cross roads. All of the things that a young man on the verge of adulthood are swirling around him. He fears that if he goes off to college no one will look after his mother who is deeply depressed. He also is unsure how to deal with the fact that he wants to go off with his boyfriend. Good coming of age drama gets a boost for being set in and filmed in Canada's First Nation. 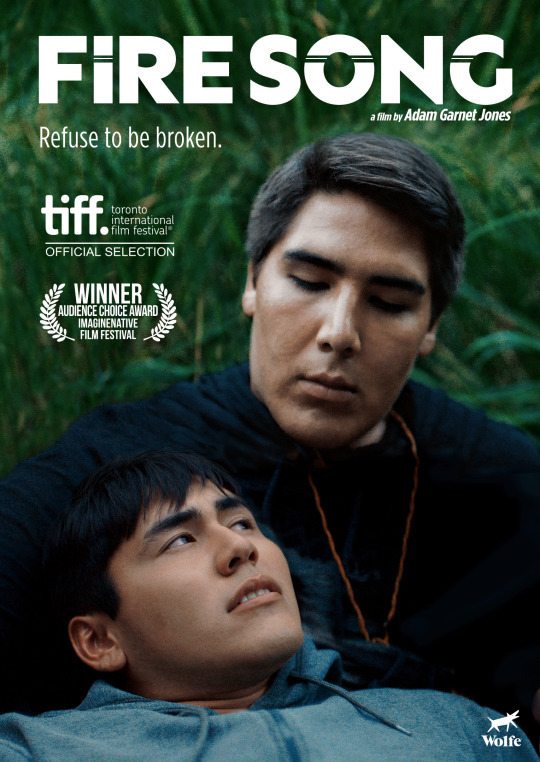 What I really liked was that the film beautifully shows life for the Canadian Aboriginal community. Normally the community gets highlighted in some way that shows whats wrong with life there. We see various problems and not life as lived. FIRE SONG wonderfully rectifies that to show that there is more going on than we are usually shown. It also doesn't hurt that it's a damn fine drama with good performances and great characters. FIRE SONG will be released in the U.S. via Wolfe Video on November 8th on DVD / VOD: across all digital platforms including iTunes, Vimeo On Demand, and WolfeOnDemand.com, and will be on DVD via Wolfe Video and many major retailers.